This Brownie Mix recipe makes enough for four homemade, ready to use brownie mixes. By spending a few minutes measuring and mixing these basic ingredients, you can make quick and easy brownies any time you want with very little effort. 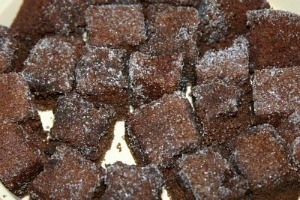 Brownie mix will keep for months when stored in tightly sealed food storage bags that are placed in a cool dry area. In this brownie recipe, cocoa is used for its rich chocolate flavor and long shelf life. In a very large bowl or pot, combine flour, sugar, cocoa, baking powder and salt. Stir until all ingredients are well combined and evenly distributed. To store, label 4 sealable food storage bags. Put 3-1/2 cups of brownie mix into each bag. Seal bags tightly and store them in a cool dry place. When ready to use, combine 1 bag of homemade brownie mix, 3 eggs (slightly beaten), 1/2 cup (1 stick) melted butter and 1-1/2 teaspoons vanilla extract, stirring until blended. Spoon batter into a greased and floured 8-inch square baking pan. Bake at 350 degrees F. for 35 to 40 minutes. Remove from oven and cool. Cut into squares and enjoy.